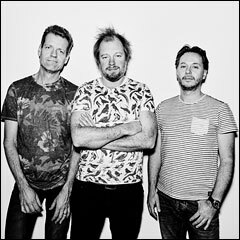 Das schwedische Daniel Karlsson Trio ist beileibe nicht zum ersten mal Thema im SOUL TRAIN (unter anderem ST#75) und zeigt auf seinem neuen Album mit dem spannenden Titel „At The Feel Free Falafel“, wohin die Reise auch weiterhin gehen soll: zeitgenössischer Jazz im Wendekreis von Struktur, Melodie und Harmonie und mit einem sensiblen Gespür für Rhythmik, Thermik und das unwiderstehliche, unvermeidliche Wippen des Fußes. Das im Stockholmer Brus & Knaster Studio aufgenommene Werk glänzt mit frischer, engmaschiger Improvisationsfülle und kontert an zentralen Punkten mit coolen Soul- und Funk-Breaks um seine eigene, schwedische Sichtweise von zeitgenössischer Jazz-Befindlichkeit elegant auszuspielen.Mastermind Daniel Karlsson (Piano), Christian Spering (Doppelbass) und Schlagzeuger und Percussionist Fredrik Rundqvist gelingt mit „At The Feel Free Falafel“ (und schon im Titel bezeichnenden Songs wie „Chilly Chili“, „The Daily Döner“, „Sambal Cymbal“ oder „La Baguette (Kampsången)“ – alleine für diese süffisante Songtitelvarianten müsste es permanenten Applaus hageln) ein Jazz-Album mit sehr eigenem Charakter und eigener Handschrift, was der Eleganz, dem Groove und der Anbindung zur U-Musik als auch zur vermeintlichen E-Musik gleichermaßen nicht im Wege steht. 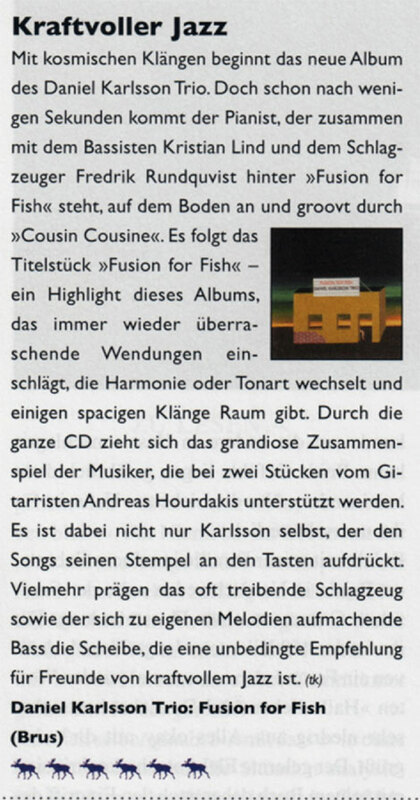 Gitarrist Andreas Hourdakis (der SOUL TRAIN berichtete) ist einer der Gäste des gutgelaunten, kurzweiligen „At The Feel Free Falafel“-Sets des Daniel Karlsson Trios, welches auch optisch (das Artwork stammt einmal mehr von Richard Johansson – und wieder: der SOUL TRAIN berichtete) und haptisch überzeugt und sogar und dankbarere Weise auf schwarzem Gold – Vinyl – erscheint – bravo! When not driving a taxi boat around Stockholm's archipelago, pianist Daniel Karlsson is best known as the pianist/organist in drummer Magnus Ostrom's band and the award-winning, Swedish jazz-fusion quintet Oddjob. The latter's chameleon-like shifts have encompassed funk and chill-out, jazz takes on Ennio Morricone's Western themes and, on JAZOO (Headspin Records, 2013), jazz—of a sophisticated kind—for kids. Das Taxiboat, however, marks Karlsson's first outing as a leader since his promising debut Pan Pan (Caprice Records, 2005), though this time he heads a trio. The conception and execution of these ten originals is impressive—the fruit of the trio's half-decade of labor. The title track reveals the depth of Karlsson's musical make-up with its blend of classical and folkloric influences, colored by occasional blues accents. Karlsson's melodic, flowing solo places him in a lineage that stretches from Keith Jarrett through Brad Mehldau to Esbjorn Svensson. The pianist' strong vamps and innate lyricism, bassist Kristian Lind's ostinatos and arco work and drummer Fredrik Rundqvist's driving rhythms lean more towards Svensson's trio e.s.t. as a frame of reference, particularly on the smoldering "Sergio's Giorgini," which juxtaposes a delicate collective approach with brooding intensity. Karlsson pays homage to two of Sweden's greatest jazz pianists, Jan Johansson and Bobo Stenson on "Johansson's Temptation" and "Bobo's Temptation," though he resists any temptation to overtly reference their respective styles. The former tune's rhythmic intensity stems chiefly from Karlsson's relentless left-hand ostinato, while his right hand roams up and down the keyboard with giddy freedom. By way of contrast, Rundqvist's gently probing brushwork and Lind's quasi-baroque bass lines underpin Karlsson's contemplative playing on the lovely "Bobo's Temptation"—an album highlight. Karlsson manipulates the trio dynamics with a deft hand, varying the pace, intensity and layering of instruments with assurance. Low-key keyboard and organ touches vary the sonic texture on the elegant "Cowboy Song," which stems from a wonderfully catchy piano motif. Karlsson's solo organ interlude sounds with cathedral-like grandeur before the trio returns to the original motif. A bass drum and keyboard pulse conjures an Indians-on-the-warpath vibe, underpinned by Lind's deeply resonant arco. The trio loosens up on "Christney's Bass Lesson," where choppy bass, uninhibited drum improvisation and slightly dissonant piano runs are sandwiched between the grooving intro and outro. Groove also characterizes the catchy "Positiv Man," which fades just as Karlsson gets a little wind in his sails. The slower-paced "Safir"—with Rundqvist on brushes—is a fine example of lyricism trumping virtuosity. Lind's winning bass riff and Rundqvist's lightly skipping rhythms drive "Quickly," allowing Karlsson bags of room to stretch out. The jaunty "Gone Fishing," the longest track, fairly bristles with energy and closes a fine set with collective swagger.